The past several weeks have been marathon canning weeks. I've done at least one project every day except for a few days when we ducked away from it all for some much needed R & R. I even did nectarines on a Sunday (I've already asked for forgiveness). While I've been bent over cutting boards, large pots and my even larger canner, my mind has been wandering toward school which starts for us again in less than two weeks. I long for it. Could it be because I can't wait to sit down?! Quite possibly. I also miss my kids. While many parents spend summers enjoying their children and maybe even shed a tear when they send them back to school, I look forward to school because it is then that I get to know my kids all over again. Oh, they're with me all summer, but I am often occupied. Lengthy read aloud sessions are just not possible when peaches are threatening to spoil and the fridge is packed to the gills with ripe tomatoes. It's helped that Jamey has been home for this five week block- they've gotten plenty attention, but I say this every year- I miss my kids during the summer. I miss snuggling to read on the couch. I miss seeing their eyes light up when they understand something they thought was going to be difficult. I love seeing their handwriting and drawings. I miss giving them my undivided attention. There is only one problem with all this. Transition. It's hard from me to transition from work work work in the kitchen kitchen kitchen to sitting sitting sitting at a table table table. To shut out what's left in the garden and on my canning to do list until the evenings and weekends is a challenge. I think I'm ready for it. Yep, I am. Probably. Too bad- either way, I've got to do it. 1) Move large homeschool pictures to the stairwell to make room for a new large bulletin board and map. 2) Make math lesson notes. Saxon's teacher books are behemoth. Way too big to actually work with, so I make notes on notebook paper and work from those. I file them away for a future year's use so I won't have to do this every year for every child. 3) Review Sadie's curriculum. It's what Sam used, but with all the excitement over Sam's new curriculum, I haven't looked over Sadie's much yet. 4) Clean out and reorganize their school baskets. 5) Move the foosball table out (boo) and move the school table back in. 6) Sign up for homeschool PE. 7) Update my meal list so I can start planning menus again. It will all come together. This year will be interesting. Miriam is learning to walk, but isn't super confident with it yet, so she still prefers to be chauffeured around the house by a finger. She sometimes takes two naps, sometimes one. Sadie will need more one on one time than last year. It will be tough, but like with anything, if it's important enough to you, you will make it happen. 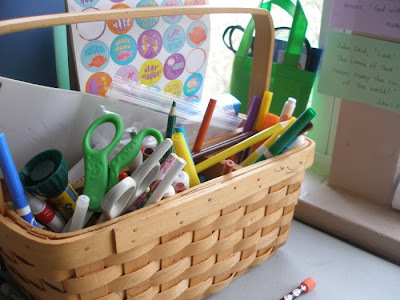 Soon, I'll post pictures of our schoolroom and share our curriculum choices for the year. Whatever school looks like for your family, I hope you have the most wonderful last days of summer and smooth and happy transitions into the fall. Answers to the questions, "How do you have enough patience?" and "What about socialization?" I'm the kind of mom who sheds tears after my kids get on the school bus, but then lets out a woo hoo! at the end of the tears a couple minutes later! This post has really helped to wet my appetite! I'm in that same transition as you right now, only my house is such a wreck. I'm busy organising too, and equally excited about snuggle time with good literature and long chats with my little ones (not so little any more!). I'll be praying for you and the rest of your precious family as you begin your school year. God still has not given me the go-ahead...we're going to see how 7th grade goes...and take one day at a time. We only started school last Thursday...and so far so good. But I'm still open to home-school should God say "go!". Reading your blog made me to think of my granddaughter, Zo going to pre-school tomorrow. It brings me tears!! She's pretty excited about that. Good luck getting everything ready! We will be sending our two back to school on Sept 7 - it will definitely be a transition! I think it's great that you home school. I don't think I would have the patience to teach my kids at home. I love them and enjoy (mostly) helping them with homework, but all day, every day? I really admire teachers and home-schooling parents! I love hearing about your home-schooling adventures. Please don't do home school posts! ;) I'm just not sure how we will have time for school this fall! I know what your saying it will be good to get to "know" the kids again. Oh how I have enjoyed having the time off. The problem I see is I don't have my canning done for winter, this means I'll be doing both. Looks like today is a first to tomatoes. I think I'll do some salsa. Hoping and praying I can find enough for a big pot of sauce. I was much less disciplined than you and did absolutely nothing in the way of organizing our schooling all summer! We managed to start this week, unorganized mostly. But there is an advantage to being a little more experienced...I think I can make almost anything work. Thanks for the post, I can't wait to see what you are doing. I'm your new follower or should I say friend. Anyway, I love reading your posts. You seem to have a great system going on with your homeschooling stuff. Happy Homeschooling! Welcome, Life of a Sweet Teen Mermaid!